Believe it or not, when it comes to applying coatings to a concrete floor slab, it’s not enough just to cast your eyes on the surface – and if it looks dry – think that it’s ready. 1. Correctly prepare the surface before applying any kind of industry-appropriate coating. 2. Ensure you measure the moisture condition inside the concrete slab before the application begins. First, we’ll take a look at ways to prepare the concrete surface. Did you know that nearly 80 percent of coatings fail because the concrete surface was incorrectly prepared? Coatings that bond well to concrete include epoxies, polyurethanes, acrylics, and stains. a) Clean and fill holes with the kind of concrete repair material that suits the job. For instance, using concrete or a high-bonding polymer will depend on whether you’re covering a crack or trying to bond it. It’s also important that your bonding material has very low shrinkage or it will not bond correctly and the repair will fail. b) Check for oil, grease, and other chemicals. Dark spots are often an indicator of grease. You can perform a water bead test. If the water beads, you know the floor has been contaminated. To clean the surface, use a heavy-duty concrete degreaser, along with a stiff bristle brush or floor scrubber. c) Acid etching is required if a concrete floor is to be painted, for example. First, run your hand over the surface. If it feels smooth, you’ll need to deploy acid etching. Muriatic acid is most commonly used. The water/acid concentration will depend on how wet the surface is and what coating you’ll be using. Pressure washing and blast cleaning are other ways to clean the concrete, again, depending on what kind of coating is to be applied. Next let’s take a look at moisture testing, one of the most important considerations when working with concrete. Why would you need to measure moisture from the inside before applying a coating? Because the slab will exhibit a moisture gradient in which the top of the slab will be drier than the bottom. 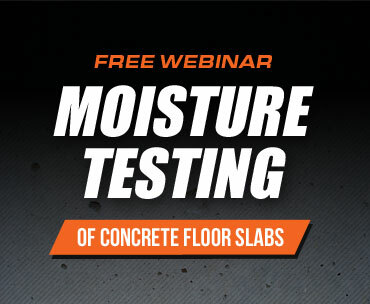 Research has clearly shown that an understanding of the true moisture condition of the slab requires an assessment of the moisture inside the concrete. Apply a coating too soon, before excess moisture inside the concrete has had sufficient opportunity to be released, and you risk peeling, blistering, de-bonding, and other unsightly and expensive issues. Taking readings of moisture at the surface, for instance, by using a calcium chloride test, only provides information about the top one-inch layer of the concrete. This layer is particularly vulnerable to ambient temperature as well as the relative humidity (RH) of the room. 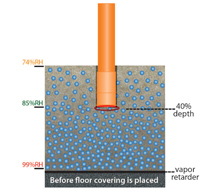 The only way to know for sure the true moisture condition of the concrete is to insert a relative humidity (RH) probe to a depth of 40 percent for a slab drying from one side. The Rapid RH® Smart Sensor meets the ASTM (American Society for Testing and Materials) F2170 standard for RH testing, which is a long-standing, scientifically-proven method. The RH test will confirm exactly how much moisture the coating or other surface treatment will “see” once the concrete slab has been sealed. Measurements using the in-situ RH method are fast, economical, accurate, and are shown to be the most reliable way for determining the right time to apply a surface coating successfully. Your tip to locate holes or cracks and filling or repairing it with the appropriate material before coating makes a lot of sense. I would imagine that buying some sort of tool to measure the crack would also help you out, as it would inform you as to the severity of the problem. Small or very shallow cracks would most likely pose less of a threat to the operation than a deep or long one. I never considered blasting as a way to clean concrete. I imagine that this would give a nice clean finish and smooth it all out. I’ll have to consider your tips if I ever need to clean concrete. Great tips! These are so important in preparing the floor properly! Our advice has always been the same; if you’re not 100% sure, consult an expert. If you think you can do it yourself, follow great articles like this one. That’s a very informative article. Great and amazing tips you have shared. I am glad that I came across such an article. It’s really important to prepare a proper base for coating, especially for concrete floors. Thanks for the tips. What concrete products do you recommef? Thanks for the question. Portland cement is great. I’m glad you mentioned that before having a concrete coating added to your floor, you should clean the surface and fill in the holes. I think it’s so important to ensure that your floors are prepared for the new coating that will be added, so that it lasts as long as possible. My husband and I are considering having a concrete coating service done to our driveway and garage. We’ll have to find a concrete contractor in our area that can help us ensure that our surfaces are prepared enough to add this protective finishing.